NASA's MESSENGER spacecraft, shown here in an illustration, will crash into Mercury on April 30, ending its 11-year mission to the planet. It launched in 2004 and has been orbiting Mercury since 2011. After more than three years orbiting Mercury, NASA's MESSENGER spacecraft will smash into the closest planet to the sun today (April 30). While the impact will not be visible from Earth, you can watch a celebration of the mission live as the crash happens. The online Slooh community observatory will host the free webcast at 3 p.m. EDT (1900 GMT) and will stream it live at: www.slooh.com/. Viewers can also follow the show on Twitter and ask questions under the hashtag #SloohMESSENGER. You can also watch the Mercury webcast on Space.com, courtesy of Slooh. NASA expects MESSENGER will crash into Mercury around 3:30 p.m. EDT (1930 GMT). However, there may be enough fuel left over for the spacecraft to make one more eight-hour orbit of Mercury before slamming into the surface at 8,750 mph (14,080 km/h). During today's webcast, Slooh will showcase the many Mercury discoveries made by the MESSENGER spacecraft. "It will be fun to talk about its many discoveries, especially its confirmation of water ice in all the dark craters at the poles," Slooh astronomer Bob Berman said in a statement. "This is possible only because Mercury is the only planet with no axial tilt, so it permits permanently cold shaded areas in all depressions at its 'top' and 'bottom'." Participants will include Berman, Slooh host Eric Edelman and several mission experts – including MESSENGER MASCS instrument scientist Noam Izenberg. The webcast will feature discussion of the mission and live views of Mercury from Slooh's remotely operated telescopes. Slooh allows its members to access remotely operated telescopes to view the night sky in high definition, and provides periodic webcasts on astronomical events such as meteor showers. 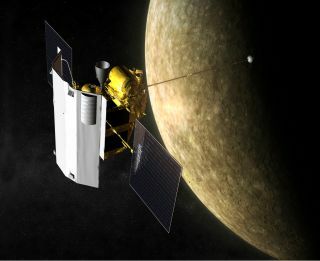 NASA's MESSENGER mission (the name stands for MErcury Surface, Space ENvironment, GEochemistry, and Ranging) was the first spacecraft to orbit Mercury. It launched from Earth in 2004 and made three flybys of Mercury before settling into orbit in 2011. But for the last several weeks, the $450 million MESSENGER spacecraft has been running on fumes as its reserves of pressurized helium ran low. It has completed more than 4,000 orbits of Mercury looking at the planet's surface and inner composition during its mission.